‘Pridelands' was created in July 2018, the result of a five-day Desert Pea Media storytelling workshop. 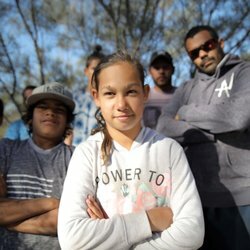 Co-written by, and starring, an incredibly talented group of Indigenous young people, community members and local Elders from Enngonia NSW - with support from DPM staff and local services. We are really proud of this production, and we hold the friendships and connections that formed during the project very close to our hearts. We felt deeply honored to create, learn and share with the Enngonia community. This project featured the musical direction and production of DPM producer Josh Nicholas (aka Hazy). We thank you brother for you artistic vision and hard work. Special thanks to Project Manager, Tannia Edwards from the Enngonia Local Aboriginal Lands Council, Kate Brown from Waste Aid, and all of the local community members for making us feel so welcome. Thanks once again to Tash and Danyelle from the EPA.